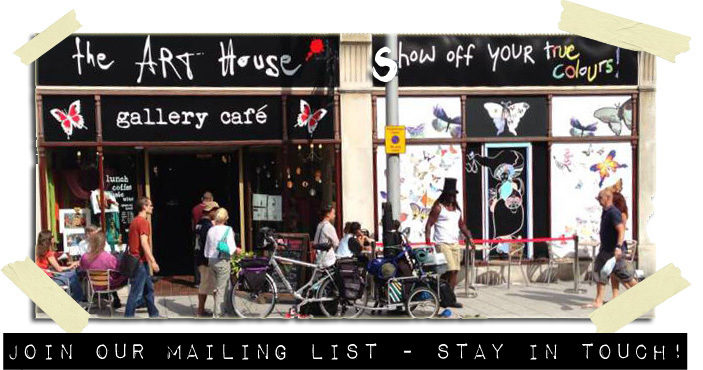 The Art House is somewhere to meet, share and create. Community run, for love and not for profit, we provide a place which is out of the ordinary, a safe place, a place where art can flourish and be shared. This is your space, as well as ours, somewhere you can meet up with friends, be inspired by a world class performance, learn something new, work in a corner on your laptop or just have some lunch! Visiting is like dropping into a good friend’s (slightly quirky) house – informal, relaxed, an oasis from the busy pace of life. You can curl up on a sofa with a book, or gather around one of our big tables for a meal, or sip wine and listen to some music. We’ve worked to provide an accepting, comfortable space where anyone who wants something a just a little different from the mainstream can feel right at home. At the same time, we are committed to excellence in our food, service and providing you with a great overall experience of the space. Most of our crew are volunteers, who give their time to make the space run smoothly and create a wonderful experience for you when you visit us. Watch one of our founding Directors, Jani, talking about The Art House in this short video.